After spending three days working with my 8th graders on a road trip project, I needed a one-day activity that was fun, interactive, and tied to the 8th grade Oklahoma math standards. Looking for inspiration, I turned to the Internet where I soon found a link to Dan Meyer's Three-Act Math Tasks via Pinterest. While I have been following his blog for years, I had never actually tried out any of his ideas in a classroom. My students still needed some more practice with proportions, so I decided to go with the Sugar Packets video. I watched the videos several times. I thought about what questions I would ask. I thought about how students would respond to the videos. I came up with a creative way to expand this idea into a 50-minute lesson. Next, I started trying to talk myself out of the idea. I started thinking about all the things that could go terribly wrong. What if the students could tell me what information they needed? What if the class isn't engaged by the video? What if this lesson totally flops? And, I probably would have succeeded in talking myself out of this lesson if I had any other idea of what to do the next day. But, it was my last lesson plan for my student teaching, and I was out of inspiration. So, I went with it, and I am so glad I did. 1. I began the lesson by having students brainstorm various professions and activities that would involve ratios and proportions. We had just used proportions to plan a road trip, and I wanted students to realize that the math we have been learning has real-world application. 2. Show the video. (Act One) The students gasped in horror at the fact that the man was eating sugar packets. One student asked, "Did he die after that?" This video did a really good job of grabbing my students' attention. 3. Have students write down guesses. It was interesting to walk around the room and read the students' guesses. Over the course of the day, guesses ranged from 3 to 200 packets of sugar. I also had students write down guesses that they knew were too high or too low. These were interesting, but I'm not sure I fully understand what types of responses I should have been looking for. 4. Next, I asked students what information they would need to solve the problem. Originally, many students wanted to use the fact that the bottle was 20 ounces. 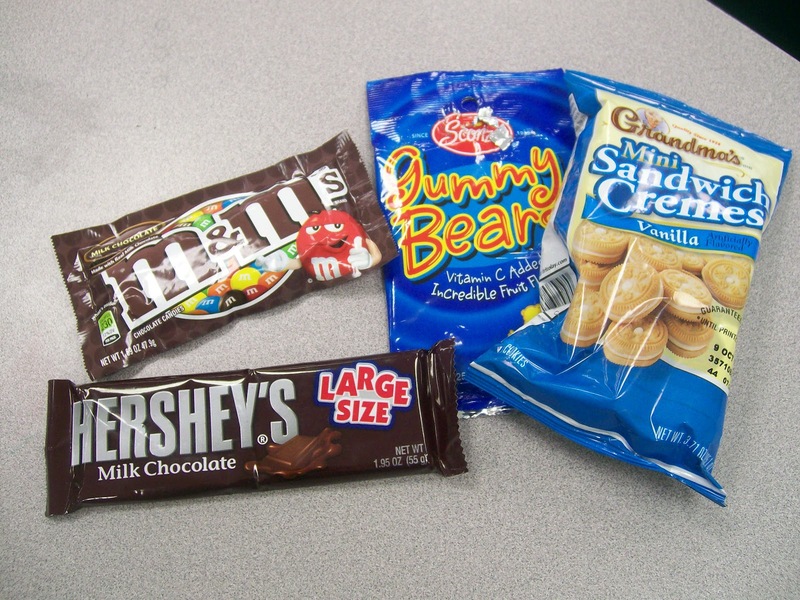 But, soon, through discussion, the students arrived at the fact that we needed to know how much sugar was in each packet and how much sugar was in the bottle. After providing pictures of the nutrition labels, the students were able to set up proportions and solve for the correct number of packets. 5. Show the un-edited video. (Act Three) I had some pretty excited students when they realized that they had used math to get the correct answer. 6. After the video reveal, I had students form 4 groups. I told them that I had gone on a shopping adventure and brought my purchases with me to class. As a group, they were asked to rank the beverages from least to greatest based on their sugar content. 7. Each group was given one bottle to start out with. Using the fact that there are 4 grams of sugar in 1 sugar packet and the nutritional information on the back of the bottle, each group solved for the number of sugar packets in the bottle. Though I wanted them working in groups so they could talk about how to solve the problem, I wanted to make sure each student was solving each problem. Each student was responsible for having a proportion and work on their paper for each bottle. As the class period progressed, the bottles circulated the room. 8. Another 8th grade math standard is choosing appropriate data displays. 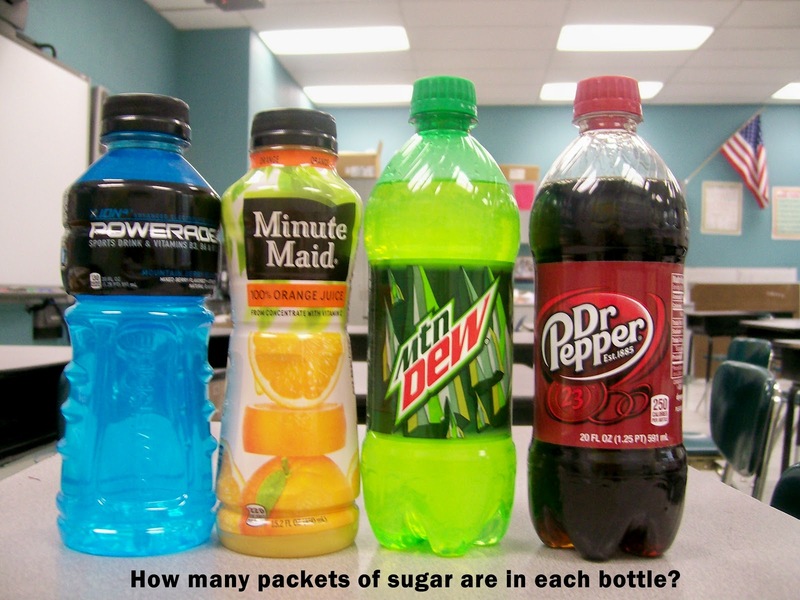 After each group had calculated the amount of sugar packets in each of the four bottles, they had to discuss what the most appropriate data display would be for this data. 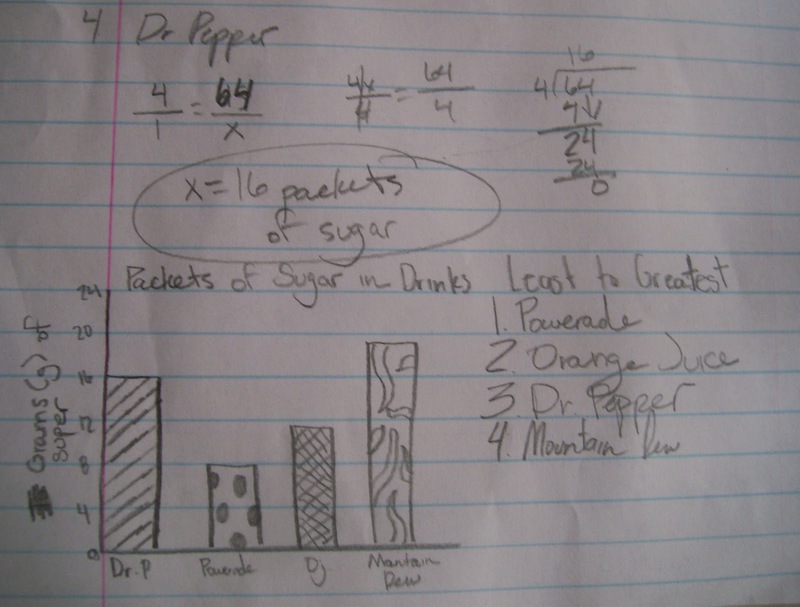 Then, each student had to create a graph of the data to show how many sugar packets were in each beverage. This led to some interesting conversations with students. "Can we make a circle graph?" "Will a line graph work?" "My group made a histogram." I was hoping that there would be more discussion/debate within the groups on which type of graph they should choose. Instead, I found myself asking students questions to guide them to the correct graphs. This is definitely an area I need to work on. 9. Based on the amount of time left in the class period, I presented students with some of my other purchases. We estimated the number of sugar packets in each food. 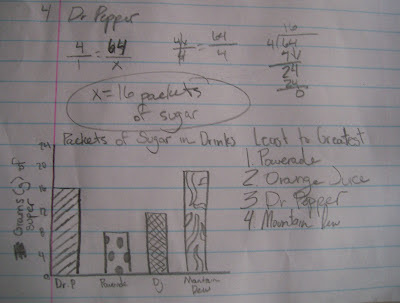 Then, we set up a proportion to solve for the actual amount of sugar packets. Overall, it was a very enjoyable lesson. The students were engaged by it. For once, they didn't complain about having to solve proportions. I enjoyed the process of helping students to discover a method to solve a real-world problem. It definitely stretched me as a teacher, and I'm looking forward to including more thought-provoking activities and questions in my own classroom next year. All that's left is to walk across the stage on Saturday. And, I will be an official college graduate. I've got a lot of exciting posts planned for the next couple of weeks. I want to share the games and projects I used with my 8th grade students after state testing was over. I want to use this blog as an opportunity to reflect on my student teaching experience. What worked? What didn't work so well? I need to figure out exactly what I should be working on this summer as I prepare for my first teaching position. Well, it's hard to believe, but I'm preparing to embark on my last week of student teaching. This experience has taught me so much about teaching, but it has also shown me how much more I have to learn. In less than two weeks, I will be a college graduate. It sounds so weird to say that. I feel like I've been a student forever. I'm hoping to find some time this week to blog about the mini-unit I did on probability with my pre-algebra students last week. But, first I need to finalize the projects my students will be working on this week. I'm hesitant to post this for fear that hitting "publish" will cause me to wake up and realize that the events of the past few days have just been a dream. My story begins on the afternoon of Friday the 13th. During the passing period, I checked my cell phone to see that a superintendent had left me a voice mail. Several weeks ago, I had submitted my cover letter, resume, transcript, test scores, and student teaching evaluation forms to this district in regards to a high school math opening. After teaching sixth period, I stepped out into the hall to return the call since my cooperating teacher teaches seventh period each day. This was at 2:30 pm. The superintendent asked if I had accepted a job yet. If not, he told me that he would love to interview me. I told him that I hadn't accepted a job and that I would love to interview with him. When I told him that my schedule was very open and flexible, I didn't expect to have an interview that very afternoon. His response was "How fast can you get here?" Since my cooperating teacher was teaching, I was able to leave school immediately and drive directly to the town the school is located in. At 3:45, I arrived in the town. The superintendent actually took the time to drive out to where I was and lead me back to the high school. I'm very thankful for this because I left the school in such a hurry that I didn't even have a chance to look up the address of the school. Less than twenty minutes into the interview, he offered me the job. By 5:00, I had been given both a tour of the school and the town. It was a whirlwind of an afternoon. I have accepted the position, but nothing will be official until the board of education votes on it in early May. I can't even begin to express what a relief it is to have a job lined up before graduation. I still have 2 weeks of student teaching left. But, I can mark "find a job" off my to-do list. Well, I've officially survived my first interview. And, I think it went pretty well. I thought it was going to be quite nerve-racking, but I was surprisingly calm throughout the interview. It was with the principal and counselor, but the counselor didn't say anything at all during the interview. I was able to give a lot of examples of student successes and tell about experiences I have had with students during the interview. Instead of feeling like an interview, it almost felt like an hour long conversation. Looking back, I would have answered some questions slightly differently. Sometimes after starting to answer something, I would realize I wanted to answer the question in a slightly different way than I had first intended. I was able to answer all of the questions. Some of my answers were just not as eloquent as I would have wished. But, this is a learning experience. With each interview, I'm sure I will feel more comfortable in my answers. The principal did give me the list of questions he was going to use and let me look over it for a few minutes before we started. But, it didn't feel like a scripted interview. Instead, the conversation sort of flowed from topic to topic. Some questions would be rephrased in light of something I had just said. The principal laughed, smiled, and made some jokes throughout the interview so I took that as a good sign. I didn't ask about the timeline for the hiring process, but the principal told me his plans while he was walking me to the front door. He is planning on doing more interviews next week, and he intends to make a decision by the end of next week. But, the board of education won't vote on it until May. He said that since we had a face-to-face interview, he would call and let me know his decision either way. My thank you notes to both the principal and counselor are written and stamped and waiting to be mailed tomorrow. He did bring up technology at the very end of the interview, and I didn't have much of a chance to elaborate on my experience with technology. I'm currently taking a class in educational technology and our assignment this week is to create an online portfolio of all the work we have done this semester using technology. So, I'm planning on finishing up that portfolio this weekend and e-mailing the principal with a link to it. So, I have less than two days left to obsess over my upcoming first interview. I've been researching the school district to find out as much as possible about it. There isn't much information on the school website, but I did read through the middle school handbook to get a feel for the school. My portfolio is ready and assembled. I feel so professional having a portfolio. It contains my resume, test scores since I have not received my teaching certificate yet, transcript, student teaching evaluation forms, two sample lesson plans, and copies of the curriculum I created to help my 8th grade pre-algebra students prepare for the 8th Grade Math OCCT Test. I also included my slope foldable in the front pocket. I also spoke with a principal today of a different school district about setting up an interview for next week! This would be a high school position where I would have more opportunities to determine what courses I would be teaching. I should have a specific date for this interview in a few days. In other news, my 8th graders are still reviewing for our upcoming OCCT test. We have been reviewing exponent rules, how to multiply and divide numbers in scientific notation without a calculator, when to flip the sign on an inequality, measures of central tendency, and more. To help the students remember that we subtract the exponents when dividing, I told them that the division bar looks like a giant subtraction sign. I'm hoping that this mental image will help them remember what to do with the exponents. However, when students do remember to subtract, many of them will subtract the exponents and then say that number as the answer. So, m to the 9th power divided by m to the 6th power equals 3 in their world. I was talking to the Algebra 1 teacher next door about teaching exponent rules, and she said that she tells her students that "a power to a power is very powerful" so we have to multiply the exponents. Every time the students encounter a problem, she makes this statement, emphasizing the words "very powerful." Then, she makes her students repeat the sentence. So, by the end of the school year, the students understand how to take a power to a power. If anybody has any creative suggestions on how to explain to students when to add the exponents, I would love to hear them. If students are having trouble understanding, I like to have them write out the problem without exponents. So 2 cubed becomes 2 * 2 * 2. And 2 squared becomes 2 * 2. So, 2^3 * 2^2 = 2 * 2 * 2 * 2 * 2. There are 5 2's so that is the same as 2 to the 5th power.